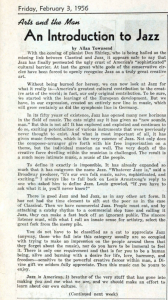 In this article is presented a very enthusiastic and nationalistic view of jazz, which aligns with popular opinions today. The history of jazz has been quite romanticized over the past decades, but it hasn’t always been championed as the emblem of American music. Jazz was a music that first emphasized the performer over the composer. 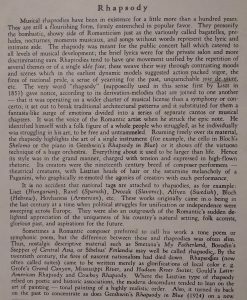 It featured improvisation over conventional structure and overall was a very rebellious art form, both musically and socially. Racism at the time created a deep-seated opposition to jazz because its racial associations and untraditional aspects. Jazz went from an unacceptable and rebellious art form to America’s music. How did this happen? First there was a time where many people, including Oles thought that Jazz was an inferior and unsophisticated from of music. And a few decades later, it was celebrated as truly American music revering its original composers and performers. Soren Lura ’31, for example had a pretty popular opinion in his time towards jazz. His opinions reflect the opposition towards Jazz for its supposed barbaric and unconventional characteristics. He states that jazz is primitive and compared it to the music and dance of cavemen. Oscar Overby, a guest speaker in 1931, also had a similar opinion to Lura with one exception. Overby had an exception that jazz was not all that bad because certain qualities were being used in modern composition. This opinion reflected the racial prejudices and divide amongst people. So how did opinions of Jazz change from Overby and Lura to Townsend’s popular view? One explanation is exactly what Overby expressed. Many people might have become more welcoming to jazz as legitimate music when it was adapted for the concert hall. This again suggests that people were only accepting to what they thought of as the most prestigious and cultivated music and that there was a clear hierarchy in music. George Gershwin was known for his compositions to include jazz and blues idioms, however it was composed for an orchestra, or a small band, both already being established genres of music. Many of his compositions were highly regarded and became the symbol of truly American music. Gershwin’s Rhapsody in Blue received much praise because if it’s unprecedented innovation in combining jazz and traditional styles, making it more palatable for white audiences. He of course received opposition as well, but over time, Rhapsody in Blue came to hold a permanent place in American music. It is interesting that as soon as a white man redefined black music for white audiences, it was celebrated. 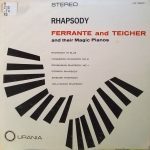 In the recording of Gershwin’s Rhapsody in Blue, in the album, Rhapsody: Ferrante and Teiche and their Magic Pianos, there are elements of jazz and concert music. Firstly, the parts are written out, ignoring the improvisational aspect of jazz. It was also meant to performed in a concert hall, instead of settings like speakeasies or rent parties, which ironically, Gershwin frequented. Based on its popularity and number of performances, Rhapsody in Blue popularized jazz for those who otherwise disapproved of it. Gershwin’s “cultivated” jazz also contributed to what people adopted as America’s sound. Gershwin’s work was so popular because he combined “low” music with modern music and provided America with a sound that was independent of European influence…even though we know it wasn’t. 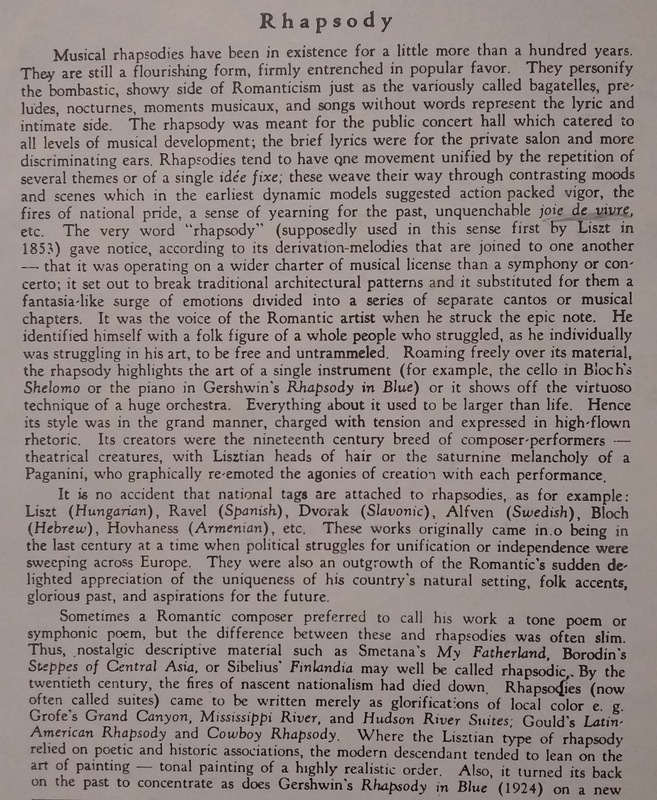 This shows that even as people were struggling to define truly American music, they still turned to the belief that European styles were superior. It is important to acknowledge these problematic issues because they contribute to the misrepresentation and erasure of a culture’s art and innovation. ClassicFM. 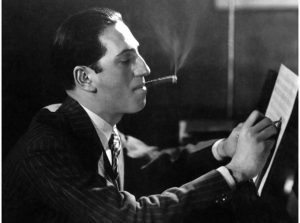 George Gershwin and the Art of America. Ferrante and Teicher and their Magic Pianos. Rhapsody, Belleville, NJ. 1955. Lura, Soren. “The Jazz Mania.” Manitou Messenger , 25 Nov. 1930, pp. 2. “Oscar R. Overby Speaks on Jazz.” Manitou Messenger , 28 Apr. 1931, pp. 1. “Rhapsody in Blue.” Nonesuch Records Inc. Nov. 1992. Townsend, Allan. 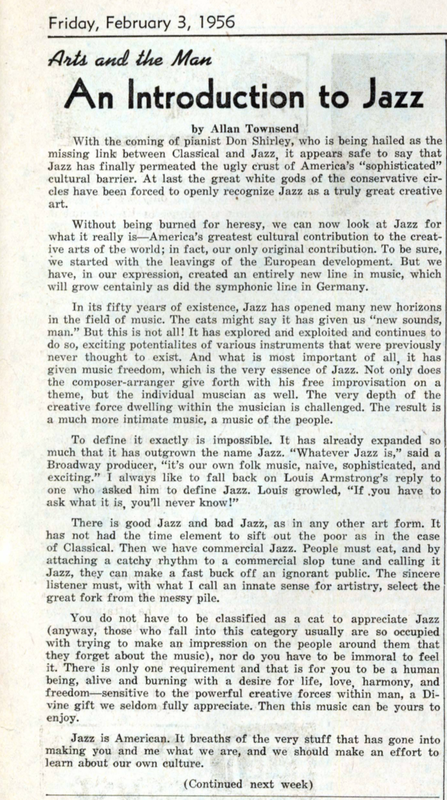 “An Introduction to Jazz.” Manitou Messenger , 3 Feb. 1956, pp. 3.